Ursula Morley-Price was born in 1936 in London, and now lives in Charente, France. She came to prominence in the mid 1970s with her organic and intricate hand-built pieces. 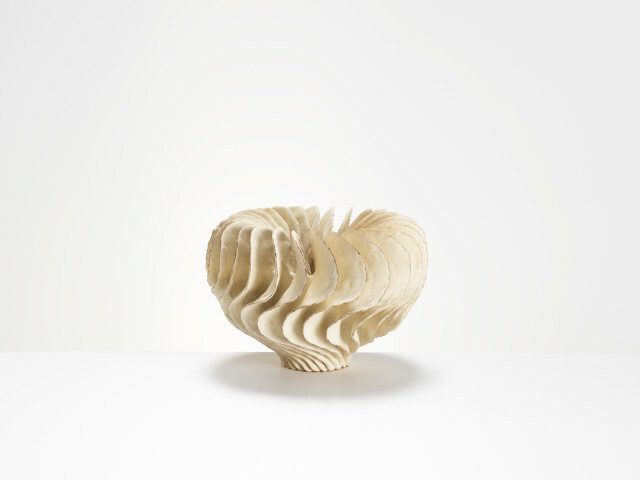 With their exquisitely rhythmic and pleated shapes they can suggest marine organisms and other natural forms. They have a quiet lyrical sense of movement and energy, suggestive of air and water-current effected structures. Morley-Price is often grouped with potters like Geoffrey Swindell, Mary Rogers, Deirdre Burnett and Peter Simpson, who all made comparably delicate work in porcelain and stoneware in the 1970s and beyond, but each was very individual, and Morley-Price’s pieces have their own distinct character and a considerable sculptural presence. She studied fine art at Camberwell School of Arts and the Slade School and began her activity in pottery in 1963.